But Jennifer Hopkins keeps fighting and is currently training for her second Ironman Triathlon. Yes... second. In 2009, she successfully completed the Ironman Triathlon— which consisted of a 3.86-kilometre swim, 180.25-km bicycle ride and 42.19-km run— without a break. That's a feat to be celebrated by any athlete, but for this Canadian lawyer, it's a remarkable achievement. "I had always wanted to do the Ironman and said that I would do it when I was healthier," says Hopkins, who was diagnosed with myasthenia gravis, a chronic autoimmune neuromuscular disease, as a teenager and warned she was unlikely to be able to continue participating in most sports. Yet, she's still training and still surviving— better than most of us. How many of us actually go to the gym? Or run at all? See her full story @ the Montreal Gazette. To give you a little bit more information, myasthenia gravis is a rare medical condition that causes abnormal weakness of certain muscles, muscular weakness without atrophy, and caused by a defect in the action of acetylcholine at neuromuscular junctions. 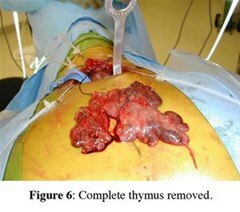 The thymus gland in front of the heart is usually removed via a thymectomy when tumors are present, but it's also a very common surgery for patients with myasthenia gravis. In the case of myasthenia gravis, the thymus begins to produce antibodies that interfere with the muscle's ability to contract— particularly the eyes, face, throat, legs and arms. Those suffering from the disease may also have difficulty speaking, swallowing or chewing, and maybe even notice droopy eyelids, blurred vision or difficulty making facial expressions. There's many ways to perform a thymectomy. You can go straight at it via an incision from the cervical notch to xiphoid notch , removing the hyperplastic thymus gland, or you can go the VATS approach , which stands for video-assisted thoracoscopic surgery (in this case, a thoracoscopic thymectomy). You can also try a video-assisted extended transcervical thymectomy . This article will show you all three methods for this surgical procedure. This surgical video outlines the complete process of removing the hyperplastic thymus gland in a patient with myasthenia gravis. If you're a surgeon, this video should help you out with techniques of the medical procedure. If you're not a doctor, it's simply interesting to watch. This surgical video outlines the step-by-step anatomical approach for doing the thoracoscopic surgery from the right side in a patient with myasthenia gravis, via VATS, by Dr. Arun Prasad MS, FRCS at the Apollo Hospital in New Delhi, India. This procedure comes straight from CTSNet, the Cardiothoracic Surgery Network, by Christopher B. Komanapalli, MD, James I. Cohen, MD, PhD and Mithran S. Sukumar, MD. There's detailed steps, pictures and links to demonstration videos. 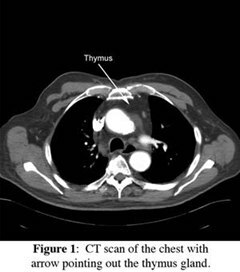 Thymectomy for myasthenia gravis, thymic cysts, thymoma less than two centimeters in size, and mediastinal parathyroid adenoma within the thymus are all indications for a video-assisted extended transcervical thymectomy (Figure 1). Thin, young female patients may be best suited for this approach, as they have a more pliable thoracic cage and less muscular chest wall compared to males. Patients who have had median sternotomy or prior radiation to the anterior mediastinum are not suitable for this approach due to adhesions that are present that prevent expansion of the anterior mediastinal space after placement of the sternal retractor, which is a requirement to perform the operation safely. Obesity is a relative contraindication to this approach, as the anterior mediastinal exposure is limited by body shape and fat and the ability of the sternal retractor to provide adequate exposure. General anesthesia via a double lumen endotracheal tube is used. The patient is positioned supine with an inflatable pressure bag placed horizontally or vertically behind the shoulders to extend the neck and to allow for improved exposure of the anterior mediastinum later in the procedure. (Figure 2 A, B). A large bore (16G) intravenous line is placed in a peripheral vein and an arterial line is also placed. The endotracheal tube is positioned to the left of the mouth and the head of the patient can be turned to the left to further improve access to the mediastinum. The entire neck and anterior chest are prepped and draped so that access to the sternum is easily available should conversion to sternotomy be required. The surgeon wears a headlight to help with illumination of the mediastinum and loops to improve visualization when performing the cervical dissection as well as parts of the mediastinal dissection which are performed under direct vision. A thirty degree thoracoscope is used to provide illumination and visualization within the anterior mediastinum. Insertion of the scope through the cervical incision is done carefully to avoid smearing of the lens and it is maintained at the right end of the cervical incision while dissecting the left mediastinum and vice versa when dissecting the right. The surgeon is positioned at the head of the bed so a direct view of the mediastinum from superior to inferior is obtained. The assistant stands to the right or left of the surgeon, depending on the position of the thoracoscope. The video monitor is best positioned at the foot of the bed so that the surgeon and assistant have the same view of the mediastinum. A transverse curved 5cm cervical incision is made 2 centimeters above the sternal notch between the sternocleidomastoid muscles and subplatysmal skin flaps are raised superiorly to the thyroid cartilage and inferiorly to the sternal notch (Figure 3, Video 1) . The strap muscles are dissected in the midline and down to the sternal notch. The upper poles of the thymus are identified on the posterior aspect of the strap muscles where they have the appearance of encapsulated fat and can be bluntly dissected with a "peanut" dissector from the surrounding tissue (Video 2). The thyrothymic ligaments at the superior extent of the poles are ligated and divided in between 2-0 silk ligatures which are left long on the thymic end. This allows for traction on the gland which facilitates the dissection into the superior mediastinum (Figure 4). 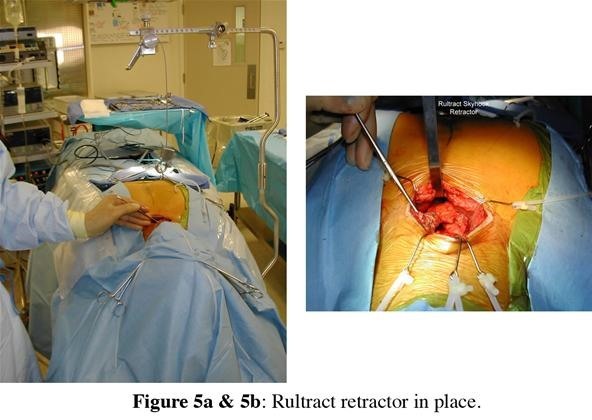 The plane just posterior to the sternum is developed bluntly with a finger and the Rultract retractor is placed and the skyhook used to elevate the sternum (Figure 5A & B, Video 3) . The inflatable pressure bag posterior to the patient is now deflated, allowing the anterior mediastinum to further expand as the middle mediastinum falls away. The thymus is dissected into the superior mediastinum using blunt, sharp and cautery dissection interchangeably (Video 4). The thymic veins are encountered posterior to the gland draining into the antero-inferior aspect of the left innominate vein. These are isolated and ligated using 2-0 silk ligatures (Video 5). Clips are not used as the repeated passage of instruments through this area during the operation may cause them to dislodge. Extension of the gland behind the innominate vein can be dissected at this time and the posterior surface of the gland is dissected to a level inferior to the vein. The substernal plane is then created bluntly using a tonsil sponge on a curved ring clamp (Video 6). This dissection extends from the sternal notch to the domes of the diaphragm and laterally to the pleural reflections and separates the anterior surface of the thymus from the chest wall. This can be done under direct vision or with the thoracoscope, which is introduced through either end of the neck wound. The left lung is deflated and the mediastinal pleura is widely opened sharply or with cautery starting from the diaphragm inferiorly to the level of the innominate vein (Video 7). Care is taken at the superior extent of this dissection to protect the phrenic nerve and internal mammary vessels; this portion of the dissection is done after the nerve has been visualized. The thoracoscope provides excellent illumination and improved visualization at this stage, but this dissection can also be done under direct vision. Use of a Yankauer sucker keeps the field free of smoke and it can be used to place tension on the cut pleural edge. Collapsing the left lung aids in the ease of performing this part of the dissection, allowing the phrenic nerve running over the lateral pericardial surface to be kept in view at all times and permitting a more complete mediastinal dissection (Video 8). Rolling the OR table to the contra-lateral side of the mediastinal dissection improves visualization and makes this part of the mediastinum more accessible. The thymus is grasped and retracted to the right and dissected medial to the phrenic nerve using a combination of sharp (thoracoscopic scissors) and blunt techniques ("peanut" or tonsil sponge) starting superiorly below the AP window and continuing distally to the left inferior pole (Video 9). Small vessels that are encountered are clipped with a 5mm endoclip applier and divided. Once the left margin of the gland has been dissected this is continued medially, separating it from the anterior surface of the pericardium sharply or bluntly. The use of cautery on the pericardium should be minimized as this reduces the chance of pericarditis and pericardial effusion postoperatively. The diaphragmatic dissection of the mediastinal fat and gland is done in a similar fashion. This dissection is continued as far right of the midline as possible. The left lung is re-inflated. The right pleura is opened after collapsing the right lung. This opening is started inferiorly and continued superiorly, taking care to protect or divide the internal mammary vein at the upper extent of the opening if this facilitates further exposure (Video 10). The phrenic nerve running over the anterior hilum is visualized and avoided as the right margin of the gland is dissected after retracting it to the left, starting superiorly or inferiorly. The dissection is continued medially until all except the upper part of the gland is attached to the anterior surface of the pericardium. The gland is grasped in the midline at the level of the innominate vein and retracted anteriorly and to the left and the posterior aspect of the gland dissected sharply to the AP window. Once this is complete the left upper margin of the gland is dissected anteriorly from the phrenic nerve in the region of the AP window. With this the gland is freed from the mediastinum and is removed through the cervical incision (Video 11, Figure 6). Any remaining anterior mediastinal and pericardial fat is removed (Video 12). At the conclusion of the operation the entire anterior mediastinum should be clear of thymic tissue and fat (Video 13). A medium sized Blake or JP drain is placed and the lung is re-inflated (Video 14). The use of the inflatable pressure bag, specialized sternal retractor and single lung ventilation are essential to provide the optimal exposure. Opening the pleura allows for the phrenic nerve to be easily identified and to perform a more extensive dissection. Use the thoracoscope and direct vision to perform the operation using whichever modality offers the best visualization. The thoracoscopic ring clamp, scissors and cautery with an extension are essential to perform the mediastinal dissection. Be prepared to do a sternotomy if needed. Transcervical thymectomy was first performed by Sauerbruch in 1912 for myasthenia gravis  however it was not till the 1960's that Crile  re-popularized the thymectomy via the transcervical route. 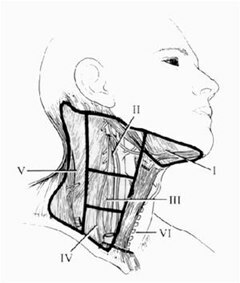 In 1988 Jaretzki coined the term "maximal thymectomy," which consisted of a cervical incision to completely dissect the gland in the neck and a sternotomy via which all anterior mediastinal tissue was removed between the phrenic nerves, the SVC and trachea, AP window . He reported an improved remission rate for myasthenia and this became the standard against which other techniques have been measured . 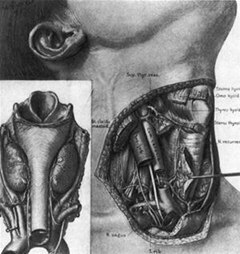 In the same year Cooper reported a modified technique of transcervical thymectomy employing the use of a custom sternal retractor which allowed improved visualization of the mediastinum . Subsequently, series employing this technique have reported comparable rates of remission to that of maximal thymectomy . Thoracoscopy, and more recently robotics, have now been added to the techniques by which thymectomy can be accomplished with either a left or right chest approach, and series have reported a short term remission equivalent to previous techniques [8, 9]. In 2003, Keshavjee described the addition of thoracoscopy to the transcervical route which improved illumination and visualization of the mediastinum facilitating the transcervical thymectomy [10, 11]. There are now numerous series demonstrating the efficacy of the transcervical route for thymectomy in myasthenic patients, with complete remission rates similar to those of sternotomy but without the morbidity [12-16]. An initial series in 1994  reported a 5-year complete remission rate of 43% which is supported by the largest series on transcervical thymectomies just published in 2006 . The complication rate was 7% and the duration of hospital stay was zero to three days [16, 17]. Preoperative disease severity is predictive of postoperative remission, with more severe disease being associated with a lower chance of remission . Thymectomy for thymoma via the neck is controversial, with little data regarding long term outcomes. If the technique is to be performed, patient selection should be limited to those with <2 cm well encapsulated tumors . A recent study advocates addition of the transcervical approach for patients undergoing thymectomy by thoracoscopy to ensure a complete thymectomy, but other series report comparable remission rates to trans-sternal or cervical approaches . The transcervical approach to thymectomy with video-assistance is a safe, reliable technique to perform a complete thymectomy with a low morbidity and hospital stay. Click through to see the entire article on CTSNet. There's also a really good article worth checking out on the Surgery of the Thyroid Gland over at Thyroid Disease Manager. You can also download the PDF here.